We don’t do average. And if you want to head off-piste in Verbier, you definitely won’t have an average day. Verbier has some really challenging terrain and fantastic off-piste so it’s little wonder its such a popular resort for advanced skiers. There are some great faces and tree lines to explore – you just need to know where to look. So why not make the most of your next stay and head out with our instructors and local experts to find the hidden powder stashes? We offer private off-piste courses in Verbier. 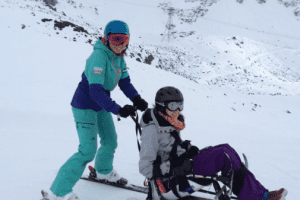 One-to-one off-piste coaching, or share an instructor with friends of the same level. Whether you’ve never ventured outside of the piste markers, or you’re looking for an off-piste adventure we’ll help you find fresh tracks and teach you to ski them with style. Your safety is our first priority. So all off-piste lessons are condition dependent. For most off-piste sessions, you will be required to wear avalanche safety equipment. If you don’t have your own equipment, we can recommend somewhere you can hire the equipment. To check your ski level and find out if these sessions are suitable for you, take a closer look at our selection of ski and snowboard videos to help you decide.